This post originally appeared on the UC Berkeley Center for Labor Research and Education's blog, Raising the Bar. According to newly released data from the Census, the first year of the Affordable Care Act succeeded in reducing the ranks of the uninsured while having little effect on employer sponsored coverage. California was no exception, and indeed showed the fifth largest drop in uninsurance of any state. The share of Californians under 65 years of age who were uninsured for the entire year fell by about 5 percentage points from 16.4% in 2013 to 11.4% in 2014, according to the newly released Current Population Survey (CPS) data. This amounts to 3.8 million Californians age 0-64 who remained uninsured throughout 2014, 1.6 million fewer than in 2013. The major changes in coverage occurred because of the opening of the Covered California health care marketplace, through which 88% of enrollees received federal subsidies, and the expansion of MediCal, California’s Medicaid program. 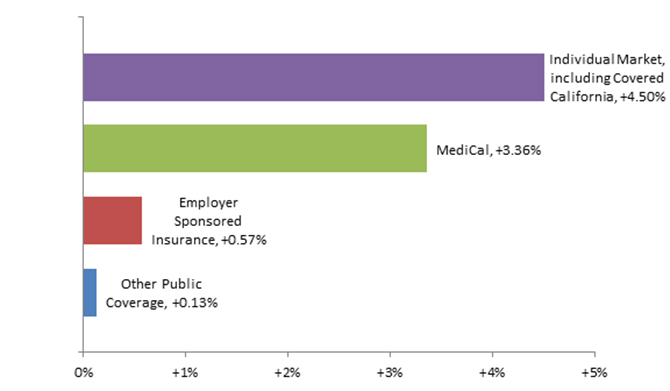 The share of Californians with insurance through an employer for any part of the year remained steady, at about 55% of the non-elderly population. Anyone working in social justice knows that poverty is at the root of many societal inequities, and health is no exception. There are roughly 6 million people living in poverty in California, with communities of color representing over three-quarters (75.5%) of this population. These numbers, from the U.S. Census American Community Survey, paint a startling picture of inequality in our state, but a new report from the United Ways of California, Struggling to Get By: The Real Cost Measure in California 2015, shows that it actually is much worse. The Census numbers rely on the Federal Poverty Level (FPL), which is currently $11,770 per year for an individual and $24,250 per year for a family of four. What Struggling to Get By reveals, however, is that those numbers are actually too low. The report creates a new metric, the Real Cost Measure, to analyze what a family’s true expenses are and what the necessary annual income is to meet them. While the Real Cost Measure varies by location based on cost-of-living differences, the average income needed to meet basic needs costs for a family of two adults, one infant, and one school-aged child who rent housing is $57,202 per year, or nearly two and a half times FPL. San Francisco’s Real Cost Measure, the highest in the state, is $73,894 per year, or more than three times FPL. The lowest Real Cost Measure in the state, $43,229 in Tulare County, is still nearly twice FPL.